Eds. 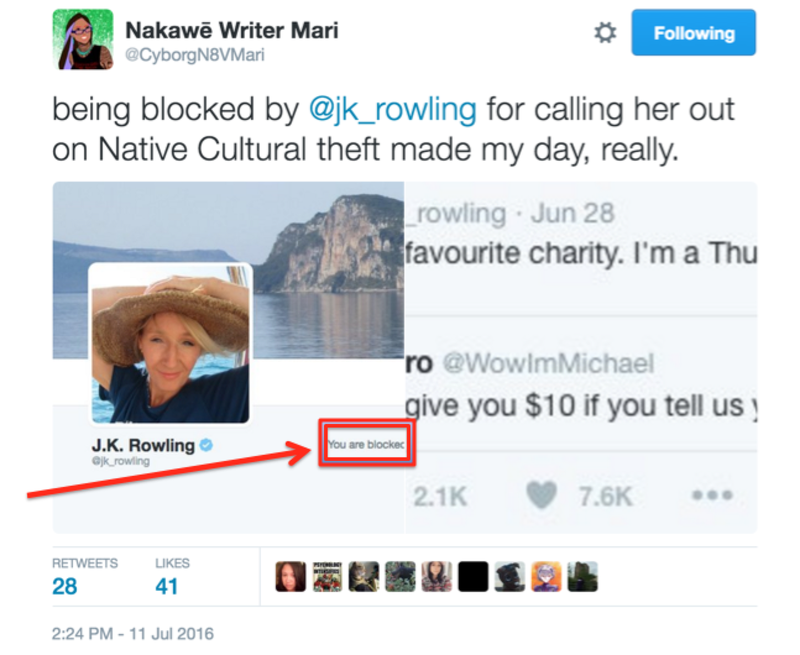 note on June 30, 2016: Scroll down to see curated list of items that Native writers have written in response to Rowling. As fans of Harry Potter know, there are (at least) two distinct responses to J.K. Rowling's "History of Magic in North America" stories. The first story, "Fourteenth Century - Seventeenth Century," was released on Monday, March 8, 2016. Fans were delighted to have more of her writing to read. Native people--those who are fans of her books, and those of us who study or write about representations of Native peoples in popular culture and children's literature--had a different response. And I'd just read Rick Riordan's The Lost Hero where a main character's dad is Cherokee, making her half Cherokee. She's taunted by other characters who ask her if her dad is an alcoholic and if she'll do a rain dance. Riordan had those words come from what we might characterize as "mean girls." I assume he did that to, in that way, show them to be inappropriate things to say, but far too many people won't pick up on that nuance. I worry that, without a direct push-back on those taunts, people will view them as an affirmation of existing stereotypical ideas, and use those same taunts themselves. Hi Debbie, I hadn't read this article expecting to be referenced, but thank you for your concerns. Yes, of course, I intended the insults hurled at Piper in The Lost Hero to be viewed as what they are: racist stereotyping and bullying, as something Piper had to deal with, just as Samirah in Sword of Summer has to deal with school bullies asking if she is a terrorist because she is Muslim. I hope that my readers will understand the inappropriateness of this bullying in context, especially as Piper's reality as presented in the book is so far from what those bullies say. Piper's dad is a great father and a multimillionaire movie star. The character with the alcoholic parent is in fact Piper's white boyfriend Jason, and as the son of alcoholic parents, Jason's struggle is something I can speak to. I try to do my homework and be respectful while representing the struggles each of my characters face, but of course I don't always get it right, and I value your feedback. With The Wild Wild West and The Lost Hero as my immediate context for reading Rowling's story, I was furious. I used the f-bomb in a tweet at her. Use of the word wasn't necessary, but the emotion it expressed was real. As I read tweets by Native people, I saw a range of emotion. Anger. And hurt, too. Native people who are my daughter's age grew up reading Harry Potter. This particular group are adults now, in their 20s. She--and they--were huge fans of every book in the series. But this short story? Their reaction to it is different. They read the first line, with its monolithic "The Native Americans" as bad, but each paragraph of that short story was laden with troubling misrepresentations of Native peoples. Those who are following the news on this story know that major media is reporting on it, excerpting a few words from a stream of tweets, or, from a blog post. Below are links to items by Native writers. Please read and share them. I'll be adding others as I find them, arranging them chronologically by the date on which I add them. If you see others, please let me know in a comment. March 10, 2016: From Sandy Littletree on Facebook, comments about Navajo people and skinwalkers. Many Native people on Twitter sent out individual, unlinked tweets. Start with the one I link to and read through the TL to find their other Rowling tweets. March 10, 2016: It's Not Only a Story: Why it Matters How JK Rowling Depicts Native American History by Elizabeth Minkel in New Statesman. 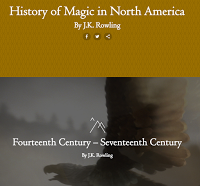 March 15, 2016: Did JK Rowling Change the Images on her Magic in North America page at Pottermore? by Debbie Reese at American Indians in Children's Literature. March 15, 2016: It's Like Muggles Writing About Wizards audio recording from Native America Calling with guests, Lee Francis and Tate Walker. March 14, 2016: Harry Potter and the Magic Indians by Marty Two Bulls at Indian Country Today. March 16, 2016: Dear J.K. Rowling: Wakanyeja Video Response to History of #MagicInNorthAmerica by Tate Walker and her daughter, Mimi, at Righting Red. March 22, 2016: The Stream - Reimagining Native Americans in the Arts (video) featuring Adrienne Keene, Stephen Graham Jones, Skawennati, and Elizabeth LaPensée. 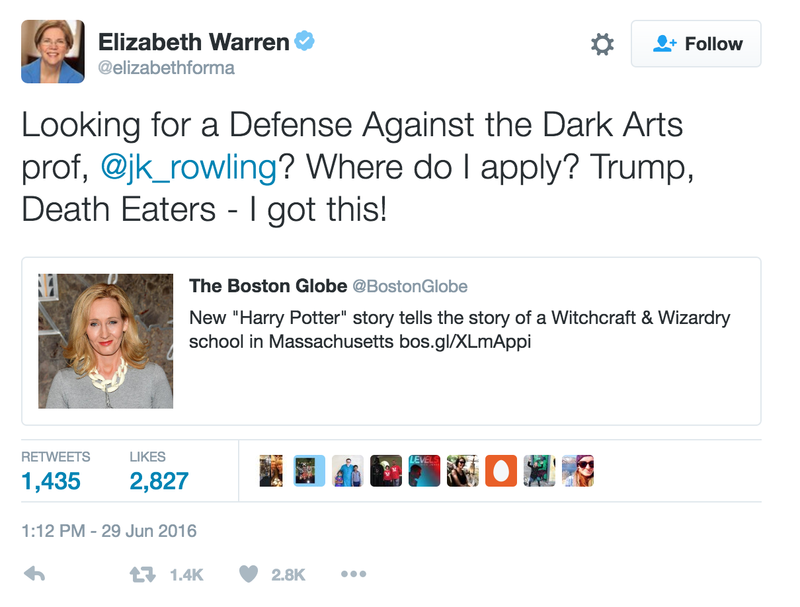 Wednesday, June 29, 2016: "No surprise that Warren, who made false claims to Native identity, want in on Rowling's new story." (series of tweets) by Debbie Reese on Twitter. Friday, July 1, 2016: Pottermore problems: Scholars and writers call on J.K. Rowling's North American magic by Paula Young Lee at Salon. Friday, July 1, 2016: Dear JK Rowling: We're Still Here by Loralee Sepsey at Natives in America. July 8, 2016: J.K. Rowling's Ilvermorny School draws criticism from Indigenous fans by Stephanie Cram at CBC News Aboriginal, includes cites Loralee Sepsey and Adrienne Keene. I thought about you when I read twitter reactions. I am very sorry that so much you work for appears to be undone. I say appears in that perhaps some good can come. There is much irony in the world. Maybe this cloud can have a silver lining. I was offended by what I read. Again, I am very sorry. I found the Harry Potter books a fun read. However, I never felt they were great literature in that you cannot pick them up and re-read them with the same interest nor did you feel any inspiration or change of outlook from the reading. Many of her fictitious beings were lifted from old folk stories and myths. You've got silent allies and hopefully this will affect book sales. The Harry Potter franchise is commercial. There is a certain amount of ignorance in the world that is always present. A real shame this had to happen. So....only Romanians and those of Romanian ancestry should be able to write stories about Vampires, right? And only people of Jewish descent should write stories based Noah's Ark, the bible, etc? And only people of Egyptian descent should write stories about mummies? If not, why not? I did not, and do not, make the argument you posit above. So in that case, are you offended by the mention of skin walkers simply because she implies they are not real? The argument is more like "gentiles shouldn't write cliched, stereotypically anti-semitic versions of Jewish stories that demonstrate complete and utter ignorance of actual Jewish cultures and peoples." And speaking as a Jew, I support that whole-heartedly. Just as I support Debbie. The legend of the vampire isn't endemic to Romania, nor are mummies endemic to Egypt. But even if they were, that's not what's at issue here. The point here is that JKR, who is a multi-millionaire with the time and resources to do careful research about everything she writes, basically called in everything she had ever heard about American culture and is lumping it all together (and I'm using the term "American," because she doesn't just do this with Native culture). And most of it, she gets wrong. Native American tribes are not just one big happy culture. Skinwalkers are not good. And no so-called "witch" of Salem was ever burned at the stake. And yet, those are the things JKR posits. So, to answer your question, of course anyone can write stories about anything they want. But if you're going to write about a culture that isn't yours, it's best to do your research beforehand so you get it right. JKR didn't. Somehow found myself on this page again (was linked by a new Twitter post) and just saw this reply! I genuinely wonder what exactly you've taken offense with and, more importantly, why. JKR uses the term "Native American" as well as the equivalent term "European." I am unclear on why one term is okay and the other, equivalent term, apparently is not. I don't think you're giving readers about credit here. No one with enough education to be reading believes that all Native American tribes (or Europeans for that matter) are the same. This is literally a 4th grade history topic here. I am not trying to be facetious. I literally started learning about the tribes in 4th grade (public school in California). I am also unclear as to why you would assume that someone in Britian should posit skin walkers as "real" within a work of fiction. Even in the US, barely anyone believes in them (some people do, of course, but most people don't). Many more people in the US believe in ghosts. However, that doesn't mean that all authors are going to treat the belief seriously, or that they SHOULD take it seriously. I am going to use the example of ghosts here because they are a very commo belief. In "Scooby Doo," for example, the ghosts always turn out to be frauds. So what? Am I supposed to be offended by Scooby Doo if I happen to believe in ghosts? To take a person's work of fiction personally (provided they are not actually writing stuff like "Everyone who believes in ghosts is a total idiot!" or something) is a bit odd in my opinion. JMO! I don't think it's healthy to take such things as a personal affront. Neglected to mention one other thing. While the video on Pottermore shows witches being burned (which happened in Europe but not the US), the story by JKR does not say they were (at least not that I saw). The vid was hecka cheesy imho. I think that you give readers too little credit. It is not difficult to understand that the statements made by characters who are bullies ("mean girls") are not the sort of statements to be encouraged. I think that there is danger in believing that all negative remarks are objectionable. Of course, it would be objectionable to refer to negative stereotypes in a book as if they are true and accurate depictions of the people. I think that it is not objectionable and may in fact be needed for fiction to include depictions of characters who are racists and who believe the negative stereotypes, so that these negative stereotypes and racist attitudes can be examined and the reader can learn to think critically and to view each person as an individual. I agree that it is not good to write clichéd, stereotypically anti-any group of people stories that do not respect other cultures and peoples. However, I also think that it is wrong to state that there can never be a character with some of the negative characteristics. It is important to show that each person is an individual. Not all native persons are drunkards or lazy or whatever other stereotype may exist. However, a particular native person may have one or more of these characteristics. I'm restating what someone else has stated, but the problem with stereotypes is that they are incomplete. If a story shows a person who does have one or more of the traits which are stereotypically assigned to his ethnicity, race or religion, the story should show that there are others of that race, ethnicity or religion without the stereotypical trait. It is dishonest, in my opinion, to portray that no single person in a group has the unpleasant traits. This creates a false depiction, just as it would be false to portray every person in the group as having the unpleasant traits. The thing about all these stereotypical traits is that there are people in every group who have them. There are drunk whites, drunk natives, and drunk African Americans. There are teetotalling whites, natives and African Americans. There are insensitive jerks who are white. That doesn't mean that there are not insensitive jerks of other backgrounds. I don't think you would have commented except that you are interested in fairness and people being open-minded. Consider the following points. Vampire tales existed before Bram Stoker wrote about Dracula. Vampires are fiction. Write something bad about Noah's Ark and try to read it in a public forum in evangelical circles. I don't think you will get a heart warming response. Think about how Salmon Rushdie's work is received by Muslims or the movie "The Last Temptation of Christ". For the latter, I remember an older man who was truly hurt someone would depict Jesus Christ that way. Mummies are a funerary practice found worldwide. Relics are holy items in some religions. Go to Europe and dig up some European and display the bones. Try to purchase a mummy in Egypt. Your crime would be cultural appropriation and a disrespect for the dead which is punishable in fines and jail terms. The reason why cultural appropriations is wrong is that Native Americans are fighting for their existence. An existence that may be obliterated with stories such as this. Cultural genocide is real. We take for granted the positive influences on the founding of the United States by Native Americans. The preamble of the American constitution is modeled after the Iroquois Confederation's constitution. I get where J K Rowling wanted to make magic world-wide. You just have to consider the feelings and effects on people other than yourself. As an American descended from mostly European colonizers, I get the story part. It is my culture too. As an American I also recognize that my rights end when they trample on another person's rights. In my opinion, the rights of native Americans and how they are being described is being trampled. Native Americans also have a right to speak their mind the same as everyone else. If someone wanted to write a book and describe someone to the point everyone recognized them and added unattractive libelous deeds, they would be able to sue that person justifiably. Why can't a group of people defend their identity depicted in a negative light? You use the example of someone writing something bad about Noah's Ark and presenting it in evangelical circles. I would expect, in such a case, that evangelicals might be upset. I agree with you there. However, people getting upset doesn't mean that it is wrong to write something bad about Noah's Ark. People can write whatever they want about Noah, and evangelicals can either read it or not. Their choice. That being said, this case is not analogous to the Noah scenario. JKR didn't actually say anything bad about skin walkers or about people who believe in them. Also, her work is not directed specifically at the very small, percentage-wise, population of people who believe in skin walkers. In JKR's fictional realm, skin walkers don't exist. It would be more analogous to point to an author who wrote a story where, say, ghosts or demons or magic don't actually exist. Many people in the US and Britain believe in all three of these things; however, that doesn't make it bad (or prejudiced or racist or whatever) for an author to write a story in which these things are not real. You mention libel. Libel laws (in the US) are pretty strict, given the 1st amendment. If I say "John Doe [a white guy] is a thief" Then John might be able to sue me and I might get convicted of libel. If I say "White people are bad," on the other hand, I am not going to be convicted of libel. See the difference? Furthermore, JKR did not actually say anything bad about anyone. She did not say anything like "Natives are bad" or "people who believe in skin walkers are dumb" or anything of the sort. People can defend their identity if they want to. I have no problem with that. I'm just saying in this particular case nothing bad was actually even said, so defending one's self is kind of a moot point. JMO. Sorry for any typos. My autocorrect is being very stupid. Did I say that nobody could depict someone as, say, alcoholic? I did not, and would not. But as I read the body of children's and young adult literature written by people who are not Native, it is as though they write with a checklist that includes "character or parent of character who is alcoholic or abuses alcohol." I read a lot of literature without Native characters, and rarely find a character who is alcoholic or abusing alcohol. That particular attribute is overrepresented in stories about Native people, and underrepresented in stories that aren't about Native people. Ze_Desert_Man, what do you think it would take to get more Native American writers into libraries and bookstores in France? We've found in our research that Europeans tend to have some seriously mistaken ideas about Native people. There's much for European readers to appreciate in the work of authors such as Louise Erdrich, Linda Hogan, Joy Harjo, Leslie Marmon Silko, Richard Van Camp, Sherman Alexie, and others. Some of them have written for children as well as for adults. I suppose translation would be one issue, at least for some potential readers (though we know there are many more French people who know English than Americans who know French or any other language). And thank you for creating this masterpost. It's extremely helpful. As an Australian Aboriginal writer, I stand with you. Thank you for compiling this list. It was really helpful for me as a non-Native person in understanding how much "History of Magic in active America" failed. I did notice that the link to Darcie Lee Badger's tweets added on March 13th takes me to Dr. Keene's radio interview again. Anonymous at 12:02 on March 13 -- thank you for letting me know the link was incorrect. I've fixed it now. Mr. Riordan -- thank you for submitting a comment. I've inserted it in the body of the blog post, beneath the paragraph where I wrote about Piper. Later I'll do a review of the book. First off THANK YOU !!! for collecting these fragmented pieces into one whole. It provides a much better picture of what is being said. I would like to also thank other readers like Veronica who see the problems you and others are pointing out. It is not "no one who isn't X can write or represent X.!" But, if you are going to publicly represent a people - do it right. Or, at least, don't be lazy. I read Riordan's book with Piper to both my sons and both picked up on the issues she was dealing with. In my opinions I think he does a good job of providing enough "mean girl" behavior to help support the idea that the insults hurled at Piper are, in fact, insults. I also find there was no such effort on Rowlings part. None. Since this site is referenced all over the place, I figured I would post my concerns with this concept here. I would like to bring this point up as I feel it is important. This outrage over Harry Potters generalization is being handled wrong. I Will specifically point out the concept that the connection to plant magic and the context that this is stereotyping the noble savage. The outrage of this concept left a real point completely ignored and one that should be known more thoroughly. At this point in time 14-17th century. Overall through out the American Native culture, the medical technology of the native population was actually superior to the European medical culture at the time. So many modern medicines that we take for granted were inspired by Native medicine through out the continent. By underplaying the outrage of the concept, it is removing important contributions of what Native people have brought to the society we all live in. By focusing on the outrage of media, a powerful opportunity to bring to the public forefront the reality of Native medical culture has had on the modern world. Even something as simple as spruce tea created a cure for Scurvy. No one knew what vitamin C was at the time was, but Native Healers (of which tribe I am uncertain of) were able to diagnose a disease that caused a lot of trouble was diagnosed and treated from plant lore of a Native People. The focus on colonialism and the justified outrage of Native people over that historic travesty also forces focus back on the negative. It ignores other aspect of history during this time frame as well. Such as the connection the many Native Tribes has with the French colonist and Trappers. Another wonderful time to bring up points of historical unity between Natives and Europeans. I live by a perspective of finding both good and bad concepts with in any situation. Creating a story of unity that took place in the past and pushing for that again would of been beneficial. My own family has ties to the Cherokee people. My ancestors being Appalachian Scott-Irish mountain folk. They also thought the native people were a little magical. There are many family tales of the tribes and my ancestors working together and living in harmony. My family history has stories of the trails in tears and the devastation that caused. The lost relationships and the break up of families and communities. We are a white as can be. There are stories of the Choctaw people aiding Irish immigrants and dramatically changing there life for the better. To this day many Irish people, descended from that group still visit the Choctaw reservation to honor that point. While is can be honestly argued that parts of this scenario were insensitive, intentional or not. It also created a point for a positive narrative to be created as well. Stories of unity and compassion. A betterment of life in general. Instead it has become a component of hatred and a continuation of more of the same. That is sad to me, there are wounds that need to healed and wrongs that need to be righted. Every one is interconnected and hate merely creates more hate. When people fail to know history we become doomed to repeat it. I know there is a fight to maintain the wide swath of native cultures in this country, there are probably more damning stories there are positive ones. Each time this sort of thing comes into play there is a chance to create unity, inform of what has happened right and what has happened wrong. Instead what I see is hatred and outrage being expressed. Would you not be equally offended if JK Rowling chose not to include Native Americans in this story at all? This is fiction. Christians didn't get offended when Supernatural came out. She's trying to include a culture in her world. Okay, you've got to remember here, in this world there is a distintion between No-maj Native Americans and Wizard Native Americans. Your culture is not the one that exists in the wizarding world. Not all Native Americans are magical, just like all Europeans aren;t magical. In that world, your people are No-majs. The Native American wizards live separately from the no-majs.